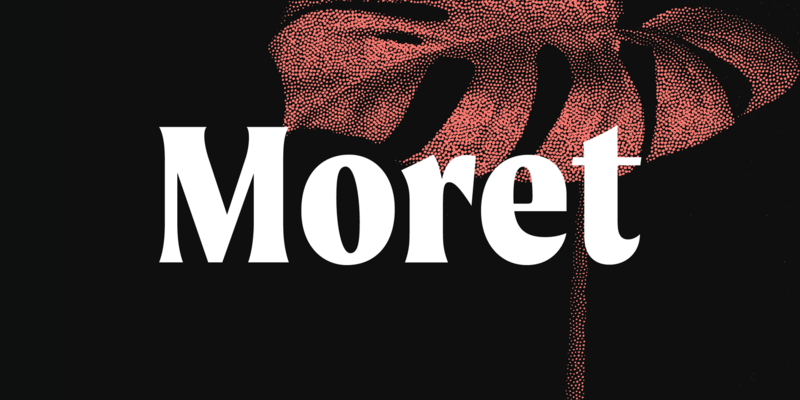 Moret is a serif typeface created by Jamie Chang and published by The Northern Block Ltd. Influenced by vintage advertising signage, Moret combines the creative possibilities of calligraphy in order to develop an authentic and energetic typeface. It comes in 5 weights and 2 styles and it offers a collection of resources that are excellent options to use in headlines, advertising, branding and editorials. It also provides support for 94 different languages, inferiors, superiors, fractions, tabular figures and ligatures. A font description published on Thursday, March 21st, 2019 in Fonts, Jamie Chang, The Northern Block by Iulia that has 439 views.